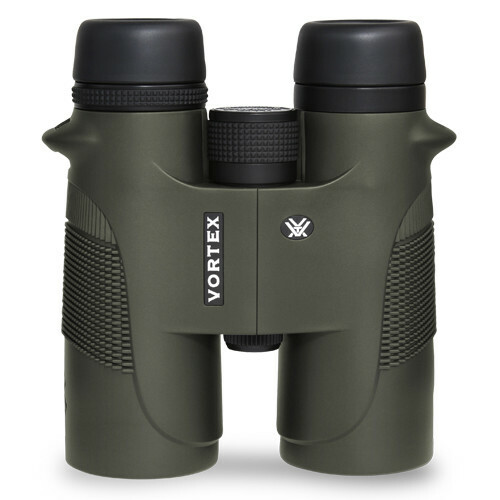 One of the main advantages of these binoculars from Vortex Optics is the versatile design. These sleek and professional binoculars are ideal for hunters out in the field and can even be used by bird watchers closer to home. The lightweight construction makes this pair easy to carry, which is always an advantage when you are hiking on the trail. These binoculars are also waterproof so you can even use them in the rain. With the Diamondback Roof Prism binoculars you can sight prey in any weather. There is a very good reason why Vortex Optics named these binoculars after the Diamondback rattlesnake. Like its namesake this pair is capable of increasing the available light so you can clearly see objects in the morning and at dusk. The multi coated glass lenses will enhance visibility so you can easily make a clear shot even in low light. This is perfect for bird watchers who might be trying to sight a rare species in the nest, or hunters who know that often the best time to look for game is in the early morning when there is very little light around. You will appreciate the wide range of vision you get with these binoculars from Vortex Optics. The roof prism 42 mm glass lenses are capable of 10x the magnification so you can clearly see objects at a distance. This gives you plenty of time to sight your prey and line up a humane shot. Not only will the optics enhance the quality of light, the lenses will also provide you will sharp and realistic colors. With everything clearly defined, even at a distance, you will find that it is easier to accurately line up each shot. Nature photographers will also appreciate the binoculars ability to display every detail even when their cameras can’t so they will know how their pictures will turn out. Vortex Optics is well known for its outstanding warranties and customer service, and all of that comes with these binoculars. The unlimited lifetime warranty ensures that you made a smart purchasing decision, and the customer service department is always ready to answer product questions and resolve any problems. While these binoculars are backed by a lifetime warranty that doesn’t mean that this pair doesn’t features a durable and rugged construction. The outer casing is constructed from sturdy rubber that is resistant to damage, and also provides plenty of waterproof protection. Even though these roof prism binoculars are affordably priced that doesn’t mean that you want to spend additional money on necessary extra parts. Everything you need comes with the Diamondback binoculars, including a protective carry case. The case not only makes it easy to pack the binoculars with the rest of your gear, it also helps to protect them from damage during traveling. The lens caps are tethered for convenience, and will provide plenty of protection from cracks and scratches. The binoculars also come with a sturdy neck strap that is comfortable to wear, so you can also keep this pair close by while still keeping your hands free to aim and shoot. Vortex Optics has designed these binoculars for use in almost any situation. Named after the Diamondback snake you can easily spot prey in low light conditions. You will appreciate the wide range of view, along with how crisp and clear images appear. With its durable construction that is backed by an unlimited warranty you can depend on a reliable performance. Everything you need to comfortably take these binoculars in the field is included with your purchase. While these binoculars from Vortex Optics do come with a durable construction some consumers have mentioned that the lens caps are not always secure. If this does cause a problem the issue can be easily resolved simply by contacting customer service. Vortex Optics is quickly becoming a leading name in hunting binoculars, and it is not hard to see why with this pair. Aptly named after the Diamondback rattlesnake commonly found in the American southwest, these binoculars will help you see objects clearly in low light. The multi coated prism lenses increase the available light, and also ensure every detail is crisp and clear. This makes the binoculars great for use in the early morning or at dusk when many types of game animals are active and moving about. You will appreciate the durable construction that is designed to last for a lifetime, along with the included unlimited warranty. This gives you additional peace of mind so you know that you made a smart purchasing decision. The lenses are fog and waterproof so you never have to worry about your vision being restricted, and with 10x the magnification you will be able to clearly spot game from a distance.